FON-870i base stations supports 15 FF-870i-H handsets, 10 concurrent calls and a range of 50m indoors and 300m outdoors. The FON-870i delivers complete cordless convenience with uncompromising quality. With excellent audio even at the edges of its range, a superior full-duplex speakerphone, robust build quality and a large, bright color display, this is our best cordless phone ever. And with an impressive 18 hours of talk time on a single charge, this phone is a true business workhorse. With support for up to 15 handsets per base and a range of 150 feet indoors, the FON-870i is also a snap to deploy. You can put a handset with its own extension number anywhere in your office without worrying about network drops. Sporting a sleek design and sturdy construction, the FON-870i is a high performance wireless extension that's packed with features and easy to use. 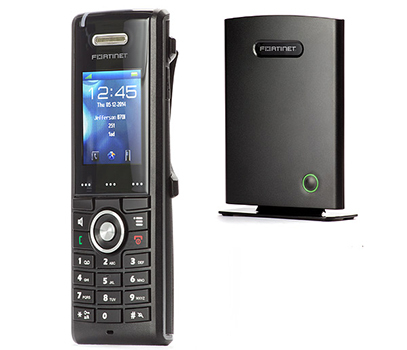 Download the Fortine FortiFone-870i Data Sheet (PDF).